Our annual Civic Prayer Breakfast is one of the most strategic things we do in the city. It builds on our on-going intentional relationship engagement with the public, private and voluntary sectors. Beginning in 2010 The Stoke-on-Trent Civic Prayer Breakfast became a benchmark for Cinnamon Network to roll out the format nationally. You can see Lloyd discussing the great mix of the ‘sacred and secular’ that inspires Saltbox to continue to grow the event each year here. Today, the Stoke breakfast is one of the biggest of its kind in the UK with more than 250 faith leaders and community activists coming together to pray for the city. 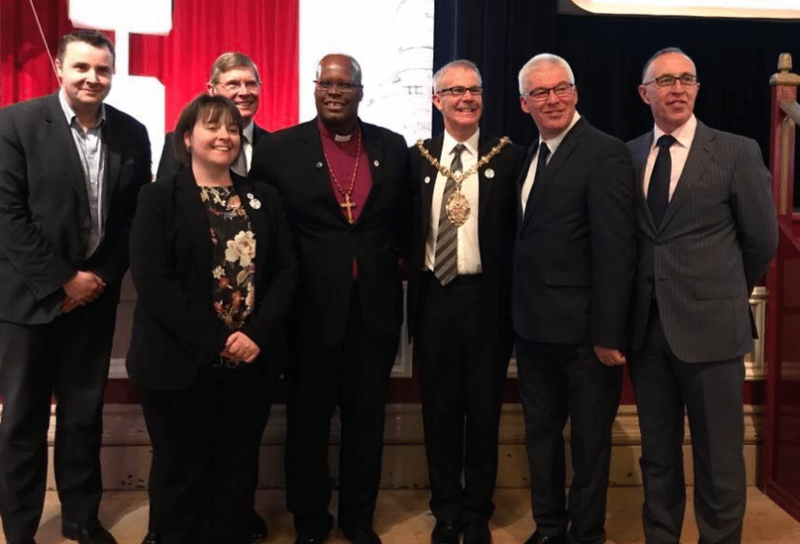 On 20 April 2018, Saltbox held our annual Civic Prayer Breakfast at the King’s Hall, Stoke-on-Trent. Over 300 people attended, making it the largest ever CPB since its inception in 2010 and one of the largest such civic prayer gatherings in the UK. 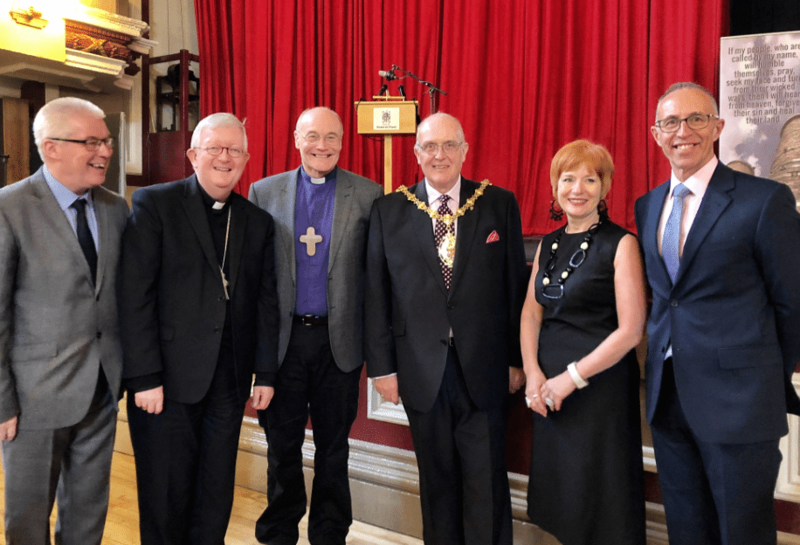 Our special guests this year included; The Right Reverend Geoffrey Annas (Church of England Bishop of Stafford), The Most Reverend Bernard Longley (Roman Catholic Archbishop of Birmingham) and Sara Williams (Chief Executive, Staffordshire Chambers of Commerce). It was so encouraging to see senior leaders from business, politics, policing and media mixing with church leaders and congregation members. There was the usual positive buzz of conversations over a “full English” and this was followed by a very special hour-long service which included songs, interviews, prayers and a keynote address from the Roman Catholic Archbishop of Birmingham. Thank you to everyone who attended and all who took part. 5 May 2017, saw Saltbox’s biggest and best Civic Prayer Breakfast yet. Over 250 faith, business and city leaders plus social activists from all walks of life gathered together to ‘pray for the welfare of the city’. Special guests were Bishop Mike Royal of the Apostolic Pastoral Council and Cinnamon Network, spoke of the transformation of our creative and vibrant city enabled through supporting one another. Deputy Council Leader Councillor Abi Brown spoke of the optimism across Stoke generated by the 2021 City of Culture bid, with prayers offered by Rev Andrew Wickens of Stoke Minster and Mo Trudel of Ministry at Work. Martin Tideswell, editor of The Sentinel, spoke about civic pride and what it means to be from Stoke and #localandproud! Also for much-needed regeneration of once key sites in the city such as the old Victoria Ground and Royal Doulton in Burslem. Finally, Staffordshire Ecumenical Officer and leader of City Vision Ministries, Robert Mountford, led the room in song and prayer, asking everybody to pray for ‘those on their left and on their right’ in a show of unity and love for one another. If you’d like to see photos and videos from the day, head over to our Facebook page or find us at @SaltboxCentre. You can also see Lloyd’s thoughts on the event in his Personally Speaking article for The Sentinel.